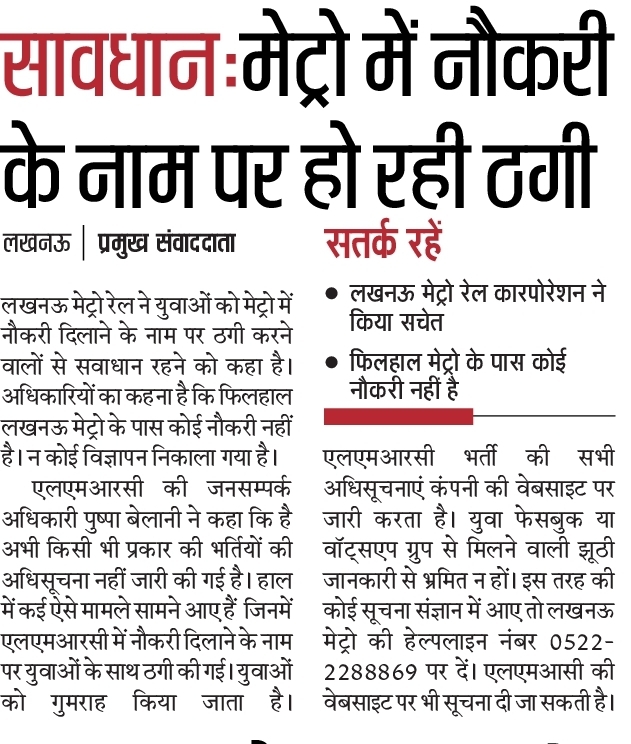 Fake Jobs Helpline Number, Farzi Sarkari Naukari Complaint Number, Fake Jobs in Metro Train, Nagar Nigam Office, UP Sachivalaya Fake Job Offer, Latest News on UP Railway Farzi Bharti, Shikayat of Fake Job. Railway Fake Jobs Offer: Lucknow Metro Railway Corporation has given Helpline numbers to contact and tell about fake job offer make by some agent to give jobs in LMRCL (Lucknow Metro Railway Corporation Limited). As per news many people are engage in providing govt jobs and we all know that today is govt jobs Maramari. People are leaving private jobs to get Government (Why it is happening we will talk in separate posts). UP Group D Tehsil Vacancy 2019: On Current Time Many State Level Govt in India unable to generate jobs in Govt but they advertise in newspaper that we will soon give notification of 3000+ jobs in UP Group D Vacancy in Collectorate Officer, Tehsil and Revenue Department. Fake Job in Bank: No advertisement issue for these popular govt jobs of Tehsil Group. Only Money holder gets these jobs. 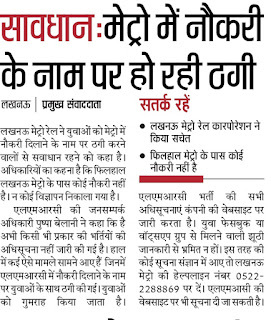 Good News: Various number of candidates filed case in High court on not getting proper information on group d jobs. UP Rajkiya Ashram Paddhati Vidyalaya Vacancy 2019: UP Government chooses Avani Paridhi. Thousand of candidates have fill form and paid application but no one able to get joining letter. Fake Jobs List: Here we are mention some important jobs that opened the eyes of candidates to not involve in these type job offer letter. 1. Pashu mitra Vacancy 2019. 4. Lucknow Metro Rail Jobs. 5. Job in Reliance, Airtel, Vodafone and BSNL Tower Installation. 6. Nagar Nigam Office Jobs. 7. Jobs in Tata Company, Tata Motors. 8. Contract Basis Jobs in Railway. Farzi Naukari Shikayat: So here we are talking about Lucknow Metro Vacancy. Many Youth contact to help line number of Lucknow metro on checking reply whether Lucknow metro department inviting jobs application or not. How to Contact Police when you trap in Fake Job and Given high amount of money to agent who dreamed you about that jobs: we advise you to before submitting application fees or money above Rs 5,000, Rs 10,000 or more you must contact to person who are working in that department. 2. Contact to Help Line Number of Lucknow Metro Rail: 0522 2288869.